To establish whether this model is appropriate for sustaining strike action. In so doing, I want to contribute to an interrogation of our behaviour on the picket line and to a critique of the normative model that governs us. Although I will not issue a call for radical upheaval, I shall insist that the current practice of permissible speech and action is ultimately self-defeating and contrary to the original intent of picketing. This conclusion will, naturally, not be news to those who have been picketing over the past few weeks, but it might help us to better understand the reasons why striking in these lands can sometimes be such a deflating experience. To peacefully persuade a person not to work. Altogether, the word “peaceful” appears seven times in the three-page document. This is quite astonishing because anyone who has ever attended an academic seminar will probably concur that the risk of lecturers suddenly expressing their demands by violent means seems rather far-fetched. What the guidance makes abundantly clear, however, is that any kind of disturbance aimed at producing discomfort is outlawed by the state. This constraint also transpires in the internal organization of the picket line, with one person (the picket “captain”) bearing full responsibility for keeping the order. The socialising effect of this strict regulation has become quite evident during this strike, where colleagues in Edinburgh have reported that they have been repeatedly asked to “tone down” the noise they were making on the picket line, or to stop barbecuing in front of entrance doors because the smell disturbed those who went inside. Just today, my (relatively) polite “really?” in response to the claim that it was compatible to fully support the strike and cross the picket line was deemed aggressive by the non-striking colleague who uttered this nonsense. I am sure there are many more examples of non-striking colleagues invoking this regime of excessive propriety to minimize the impact of the picket line and to guard themselves against difficult discussions. Facts matter: One purpose of the picket line is to inform others about what is going on. So, the goal of picketing is not only to promote “our view” of the debate, but also to steer the controversy towards “falsifiable facts”. Implicit in this idea is a commitment to objectivity, which is different from one-sided propagandizing. Persuasion is possible: If we are to try to convince others not to cross the picket line, persuasion must be more than a theoretical possibility. We can identify here an assumption about the “force of the better argument”: Once you show, with sufficient clarity, that certain statements are self-contradictory or unfounded, then the agent who is wrong will have to change her behaviour and show solidarity – she will refrain from crossing the picket line. Dialogue should be calm and rational: Given that persuasion is a real prospect, it will most likely succeed in situations where people remain calm and rational, both listening to, and trying to convince one another, with plausible arguments based on objective facts. Teach-Out, Edinburgh, March 13, 2018. Photo by Matthew Chrisman. The theory that best captures these dimensions is deliberative democracy. Authors such as Jürgen Habermas, Seyla Benhabib or John Dryzek have over the past three decades tried to defend an account of democracy that resonates with the guidance provided by UCU. The idea that good citizenship involves, amongst other things, the ability to provide and respond to reasoned arguments about contentious issues appears intuitively plausible. Should we therefore applaud UCU, and the British state, for basing its strike laws on such an influential theory of democracy? The answer is (a qualified) no. Typically, the activist eschews deliberation, especially deliberation with persons wielding political or economic power and official representatives of institutions he believes perpetuate injustice or harm. He finds laughable the suggestion that he and his comrades should sit down with those whom he criticizes and whose policies he opposes to work out an agreement through reasoned argument they all can accept. The powerful officials have no motive to sit down with him, and even if they did agree to deliberate, they would have the power unfairly to steer the course of the discussion. Thus, the activist takes other action that he finds more effective in conveying his criticism and furthering the objectives he believes right: picketing, leafleting, guerilla theatre, large and loud street demonstrations, sit-ins, and other forms of direct action, such as boycotts. Note that Young argues explicitly in this passage that picketing should not be subject to the constraints of deliberative democracy, for it is a form of direct action taken in response to a perceived injustice or oppression. We can easily see why this “activist” framework might be practically more apt for governing our behaviour, once we return to the very first point that the UCU guidance emphasizes: that the picket line is supposed to gather and disseminate information about facts. That kind of information exchange might be useful in cases where colleagues have put their heads in the sand and not cared about anything related to this dispute. Maybe in these contexts, calm and rational argumentation will work. I would presume that some of you will have had success in persuading colleagues to turn around and not cross the picket line, precisely by appealing to their good will to grapple with our reasons for striking. But what happens when we switch focus, from our well-meaning colleagues and students, to those who are employed in the University management? Does the deliberative model still apply when we confront those who possess so much more power than we do? Do we have to listen to them, and can we reasonably expect they will listen to us? I want to suggest that, as members of the academic community, we should certainly try to listen and make our claims heard, but we must not assume that the other side will do the same and take our standpoints seriously. The employer side in this labour conflict has displayed a shocking disregard of our views. What is worse, the secrecy shrouding the entire process – from the way in which the consultations on the pensions deficit were set up to the ongoing negotiations on the national level – contradicts the publicity requirement of functioning deliberation. The shameful deception orchestrated by the UUK reminds us that insisting on getting the facts right will be of only limited value if your conversation partner is bent on abusing their power from the outset. Deliberative democracy remains centrally premised on reciprocity, the public display of respect through the giving and taking of reasons. If a deliberator joins the debate by painting an incomplete or fraudulent picture of reality, one way of responding is, of course, to attempt to correct that lopsided picture with as much rhetorical force as possible. Part of the recent controversy has accordingly been about compelling the UUK to reconsider its pension calculations, by stating that the basis on which these calculations were made is plainly wrong; we have the experts to prove that, and you better answer to our claims. Call this the Otsuka strategy. But simultaneously we must be careful to avoid wishful thinking: if there is a deplorable history of deception, then institutional and often personal trust has been damaged. As a consequence, it would be dangerous to hope that your conversation partner acts in good faith when defending particular positions. In situations of eroded confidence in each other’s sincerity, reciprocity cannot simply be taken for granted. We must begin anew and with great caution, by soberly acknowledging that currently no basis for a calm, rational debate exists. Perhaps it can again be established in the future, and we should do our best to work towards that goal. But a realistic perspective, which factors in historical encounters and failures to understand one another, involves accepting that dialogue is not always possible, nor is it desirable under all circumstances. This is precisely the moment when pickets have to become something other than places of dialogue. What we need today is an activist model of political speech and action that makes use of the full panoply of non-violent resistance. What I want to suggest is that, as political theorists on the picket line, we should move away from a concern with Habermas, Benhabib and Dryzek, and turn instead to Gene Sharp’s analysis of non-violent resistance. Sharp’s writings teach us that only a diversity of tactics will prove successful. I think he is right. Does this mean that arguing on the picket line is always misguided? Of course not. It is important that we collectively take the task of deliberation seriously, especially with regard to colleagues who are just ignorant or prone to inconsistent statements, such as “I fully support the strike, but I have a lot of work to do.” Yeah, I am sure you have, and we don’t, which is why we enjoy standing in the cold rain so much! As a general rule of thumb, we can probably say that, where the playing field is relatively equal, we should invest our hopes in the “force of the better argument” to do its work. A good activist must be an effective conversationalist, not least to address disagreements within the campaign she is supporting. And, after all, as academics, we are in the arguing business. Deliberation is our bread and butter, which is maybe one of the reasons why we have so uncritically endorsed it as a valid model for our behaviour on the picket line. But where the playing field is skewed towards one side of a conflict deliberation imposes unequal burdens on conversation partners. It is imperative that we are not tricked into believing that rational argumentation exhausts all that there is to political speech and action, as the UCU guidance suggests. The fact that the picket line is today governed by a regime of excessive propriety indicates that one of the key ideas behind picketing has been comprehensively undermined. 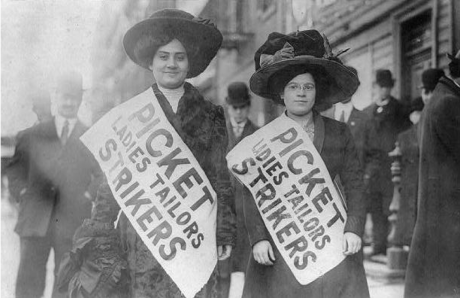 To understand this, let us raise a simple question: If picketing were indeed only about information plus persuasion, where would workers’ or women’s rights in our part of the world stand today? (I am asking a question here about the historical development of these rights, not about their current state.) It does not need reminding that the original intent of the picket line has always been militant, echoing, in some respects, its historical predecessor, the barricade: to completely disrupt the normal functioning of the workplace by building a barrier. It is vital that we keep this radical aim in mind, and ponder how we can recapture its spirit, when we reflect on the next steps in this industrial action. It follows that, at the very least, disturbances of the public space within the University should remain firmly on the table. The fact that we cannot occupy University buildings without the threat of punishment, is a sad indictment on the state of our institutions. In this regard, it is immensely uplifting to see once again that it is the students who have taken the plunge. Their recent actions around the UK, courageously occupying administrative and teaching buildings to show solidarity, is a highly disruptive measure that should make all of us proud. Moreover, we must also reclaim the right to make people with more power feel uncomfortable. One can generate unease in people with the help of strong arguments – if those people are generally receptive and willing to listen. Sometimes, however, other forms of speaking and acting politically work better: from shouting to shaming, from singing to dancing. This is where creative practice emerges as a central instrument in the activist’s toolbox. Change cannot happen without producing at least some discomfort, for the simple reason that it hurts to be alerted to one’s privilege. 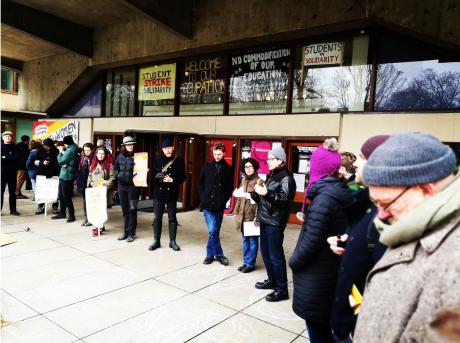 These thoughts were first presented at a Teach Out session on The Ethics of Striking outside Edinburgh University on Tuesday 13 March, 2018, along with presentations by other members of the Political Theory Research Group.